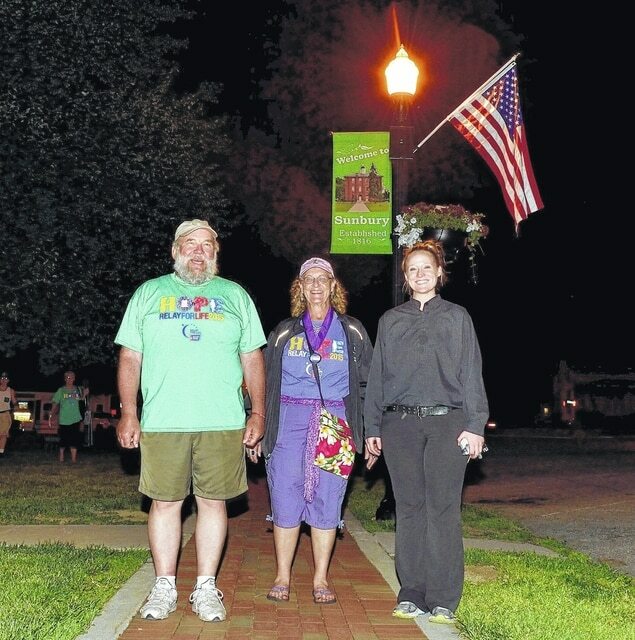 It was late, the last lap following an 11:30 p.m. closing ceremony, when Belinda Jackson of Team Jackson, center, and Sunbury/Big Walnut Area Chamber of Commerce Administrative Assistant Meg Howard, right, joined Relay For Life of Big Walnut co-chair Dave Martin, left, for one final lap around Sunbury Village Square. Martin said Big Walnut’s 2015 Relay For Life exceeded its $52,000 goal before the evening was over, in cash, not counting pledges. The Relay For Life of Big Walnut was held last Friday evening on Sunbury Square, and by the evening’s end, event co-chair Dave Martin had good news. Martin said this year’s Relay For Life goal was $52,000, and the goal was exceeded. Martin said the first Relay For Life was in 1985 when Dr. Gordy Klatt walked and ran for 24 hours around a track in Tacoma, Washington. Sarah Swegan, American Cancer Society community manager for Relay For Life, said more than 50 cancer survivors registered for the 6:30 p.m. Survivor’s Lap, and eight teams registered for the new, shortened Relay For Life format. All money raised during Relay For Life events goes to the American Cancer Society. Area residents may continue to contribute to the 2015 Relay For Life of Big Walnut total via their favorite Relay teams until the Relay season ends on Aug. 31. This year’s Glow4Hope 5k run/walk to benefit Relay For Life of Big Walnut will be on Saturday, July 18. For more information, search for Glow4Hope on Facebook.